Chinquapin Prep, a non-profit, college preparatory school for grades 6 through 12, serves economically disadvantaged youth from the Houston area. 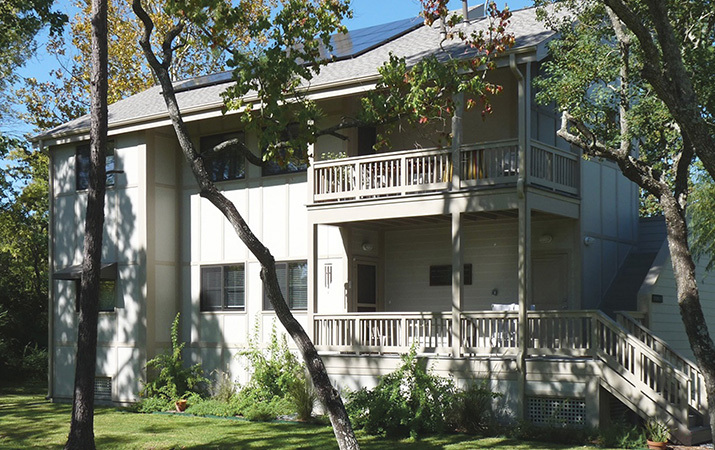 In 2007, the students engaged in a real-life project by helping to design a much-needed faculty duplex that would serve as a model of sustainable design and an on-campus educational tool. One of the many lessons built into the building is a central vertical shaft which channels cooler outside air through the building to extend the spring and fall seasons. Windows in the shaft allow the center of the building to borrow daylight from skylights above and allow students to observe the building’s components at work. The building is oriented to take advantage of southeast winds, solar gain in the winter, and shade in the summer. Each residential unit is roughly 1,000 square feet and is designed to house a single faculty member or couple. Large porches provide gathering spots and a pleasant view of the surrounding landscape. The building is LEED Silver®. The LEED, National USGBC Newsletter, 29 April 2009, "Chinquapin School Building Scores LEED Points"
Baytown Sun, 9 April 2009, Chinquapin School reveals 'green' venue"
Lake Houston Sentinel, 8 April 2009, "Chinquapin School completes first 'green' building"